Nothing says Spring like the scent of BBQ in the air. 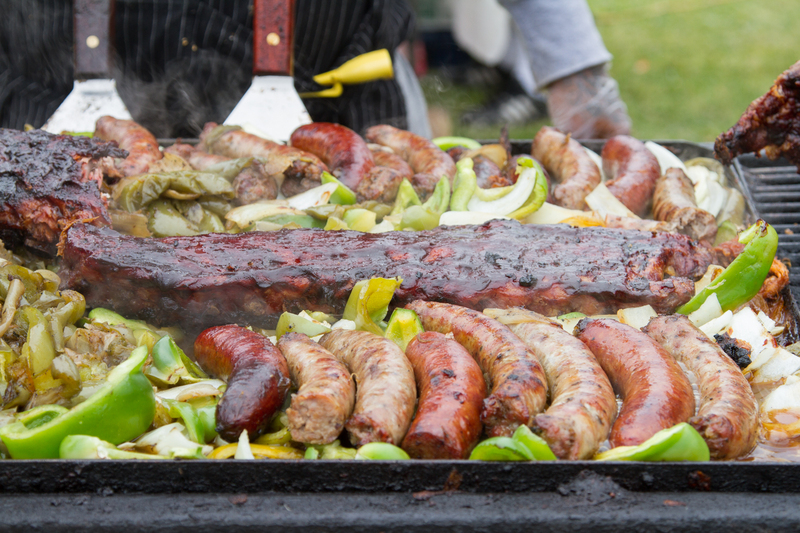 This coming Saturday, May 14th, the Queen Mary is hosting the 5th Annual West Coast BBQ Classic, featuring both expert and amateur grillers, all of whom are competing for the title of West Coast BBQ Pitmaster Champion. The title not only comes with a coveted spot in the grilling world but also a $10,500 prize. I had the chance to sit down with two of the competitors and talk to them about their cooking styles and taste inspirations. Chef Chris Andes from Outta Gas BBQ got his start in grilling in his early 20s, although he admits in the beginning he was "burning more stuff than making edible food." Practice makes perfect though and before too long, he was learning how to control the flame, and perfecting his flavor profile. Garlic, salt and pepper make up the base of Andes' unique style, from there he layers such ingredients as soy sauce and sesame oils, among other secrets, to create original and vibrant tastes. Chef Andes encourages anyone who might have ever had the grilling bug to give competition a go. "I was on pins and needles for weeks when I signed up for my first event thinking I would embarrass myself but knew I would hate myself if I didn't try." With the encouragement and help from his family and friends, however, that initial competition grew into one of the best BBQ teams on the west coast. When asked what visitors to the West Coast BBQ Classic can expect at this year's event, Chef Andes responded: "Visitors can expect to go and eat some great BBQ from some of the best BBQ cooks in the country at the WCBC. The setting of this event is awesome, being in the harbor right next to the famous Queen Mary. Live music, games, public contest and a nice array of adult beverages!" Another competitor in this year's event, Chef Rick Mysee turned to cooking out of necessity. "My wife had to take care of her ailing parents in Montana for months at a time and left me with our five kids to feed. After two days of Frosted Flakes and waffles with lots of whipped cream, it became apparent I had to do something quick. That really was what motivated me to start cooking." From these humble beginnings, Chef Mysee quickly regained his grilling roots: "As a kid I helped out on multiple ranches within our family in Montana where beef was king. Cooking meat over fire was always the preferred method!" Soon, Chef Mysee was winning BBQ competitions all over the country. His flavor profile offers a different side to BBQ than Chef Andes. "Since I have a notorious sweet-tooth, I prefer Kansas City style where the sauce is tangy but toward the sweet side." Chef Mysee's restaurant, Hickory and Spice BBQ began as a way to offer meals to charities and non-profits. Mysee and his crew have donated over 10,000 meals in the last four years and have no intentions of slowing down. Chef Mysee stays busy in the competition circuit: "In one short year we have been Reserve Grand Champions three times, Grand Champions once and are currently ranked 29th among KCBS teams nationally (out of more than 3000 teams). We are blown away by the success we've enjoyed and appreciate every walk we get immensely!" Both chefs prove that the most delicious BBQ is truly a labor of love and can vary from savory to sweet. Come sample the best on Saturday, May 14 at the Queen Mary in Long Beach. Admission tickets range from $25-$35 for VIP access. Hours for the event run from 11am to 6pm and events include a mercantile, live music and a wide variety of activities and games for all ages. For more information about the 5th Annual West Coast BBQ Classic click here.